A silicone implant is inserted at the base of the breast. The pink area on the left side shows the sub-pectoral “pocket” that is surgically created for the implant. The right side shows the incision and the pectoralis major muscle. Breast implants are usually placed under the pectoralis major muscle. The fold at the base of the breast (also called the inframammary fold) is an excellent approach for augmentation for many Portland patients. This method is called breast fold breast augmentation or inframammary fold breast augmentation. The incision is about 1.5 inches long for placement of saline implants and about 2 inches if silicone gel implants are used. This scar should fade well, but is usually visible if inspected. 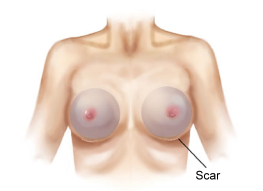 This is a great choice in Portland patients with deep folds or mildly droopy breasts, as the scar usually blends into the crease well and is never seen when the breasts are directly viewed. In Portland patients without folds, this scar is more difficult to hide. In most patients without folds or very small breasts, a fold or significant downward arc of the breast will develop after augmentation. In those cases, the inframammary scar will usually not be noticeable on direct view of the breasts. Once the incision is made, the surgery is taken through the fatty layer to the border of the pectoralis major muscle. The sub-pectoral space for the implant is then precisely opened under direct vision and the muscle is cut at the base of the breast. If the breast implants are to be placed under the breast tissue (above the muscle) a space is opened up between the breast tissue and the chest muscles. On the right, an empty saline implant is placed through the breast fold. The left side shows a breast implant in position. 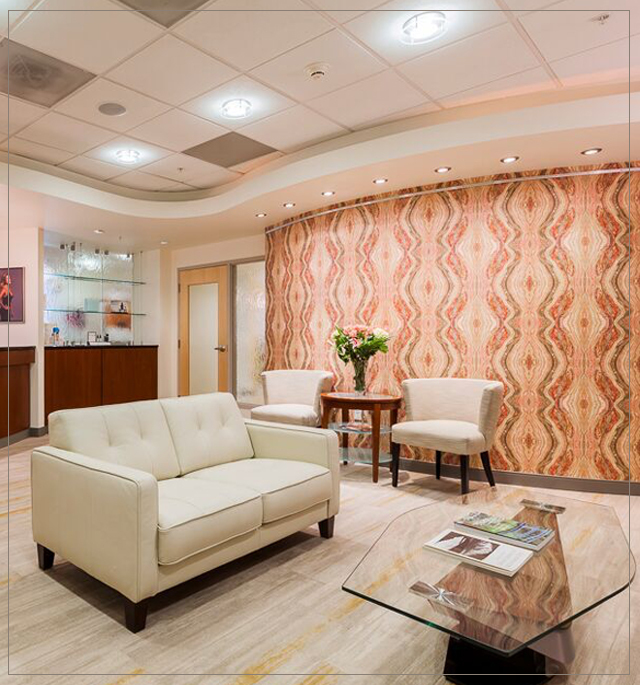 Placement of breast implants through the fold at the base of the breast is the most common approach for breast augmentation in Portland, Oregon and Washington, and nationwide. This approach provides the most direct access for implant pocket creation and breast implant insertion. It also allows direct exposure for additional manipulations of the breast tissue and/or pectoralis muscle that are often required to treat some special breast shapes and conditions. Women (especially those with deep breast folds) commonly request this technique. 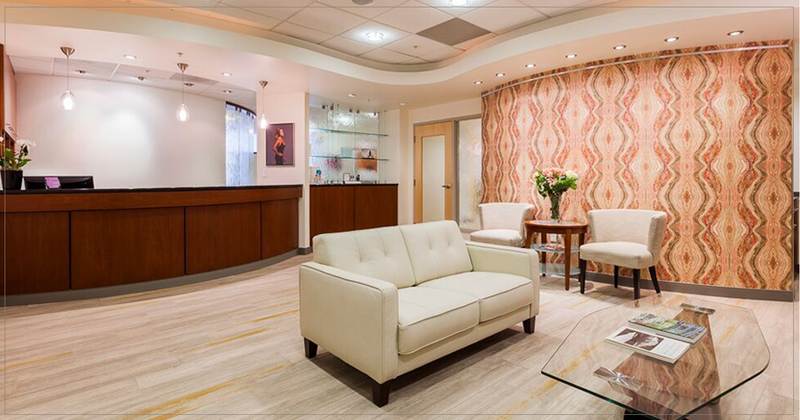 In our practice, this breast augmentation method is selected by the majority of patients. If saline implants are used, they are filled to the correct volume. (Silicone gel implants come pre-filled and sealed from the manufacturer.) The size, symmetry and shape are then assessed. If needed, the patient’s back will be raised as in the sitting position and the results are assessed with the patient “sitting up” (while under general anesthesia). The incisions are closed with dissolvable sutures, all under the skin. The wounds are covered with tissue glue or tape, gauze and a small clear dressing. Finally, a post-surgical sports bra is placed. Breast augmentationthrough the breast fold approach with the implants in a good position. The recovery is very similar for all three of the approaches to breast augmentation. The post-surgical pain is similar for all three approaches, as well. This is true because the majority of the pain after breast augmentation is from the manipulation of the muscle and creation of the space for the implant. These maneuvers for creating the space for the implant are nearly identical with all three approaches to breast augmentation. After breast augmentation, no drains, pain pumps, or chest wraps are used—you simply wear a post-op bra, which is similar to a sports bra. You go home a couple of hours after surgery to rest. The day after surgery, you start feeling well and can shower and shampoo and blow-dry your hair. Most patients can return to most of their home and work activities within 5 to 7 days. Some patients return to work in 3 to 4 days after surgery. You can perform some exercises three weeks after surgery and you can resume full activity six weeks after surgery. For more information about the surgical experience please see our sections on day of surgery and your recovery. Learn more about breast fold breast augmentation or inframammary fold breast augmentation. Contact our office in Portland at (503) 783-0544 for more information.